Copyright © 2005, 2006 by Lawrence A. Ruttman. All rights reserved. Website by Lisa Pemstein and Susan Worst. 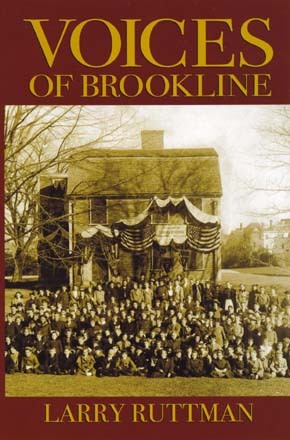 A new book featuring stories, reflections, history, and insights from the citizens of the Town of Brookline, Massachusetts, on the occasion of its 300th birthday. Read a review from the Jewish Advocate and a news story from the Brookline TAB. informs us in a flowing style of all the facets of Brookline life going back as far as the eldest among us. His informative and anecdotal stories make it clear there is probably no other community in which more people are more deeply involved in civic life. For more information, click on the links at the top of the page.